When we searched Mark Penn‘s name yesterday on Bing, using our Surface tablets (psych!) and saw this headline we wondered, “Why would anyone want to fire this guy? His track record is just as spotless as his ethical record!” Remember the Wall Street Journal column he used to promote Burson-Marsteller while he was acting CEO? Good times. Oh, and remember this 2008 gem? 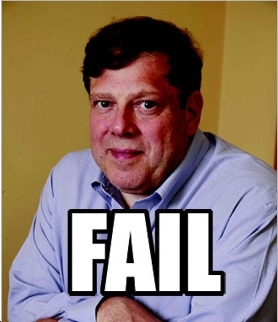 Thanks, Mark Penn! Now why might Microsoft, according to the story broken by Re/code, be thinking about letting the guy go? Maybe they read this Hubspot post about how new CEO Satya Nadella should fire him and call off the “idiotic” Scroogled campaign because new leader, new face. Maybe they realized how much he has in common with outgoing CEO/longtime chum Steve Ballmer: loud, annoying and bad for business. The reality is a little less exciting: he just doesn’t get along with EVP of marketing Tami Reller, and Nadella apparently got the message. Right…but didn’t this one convince you to abandon Google forever?